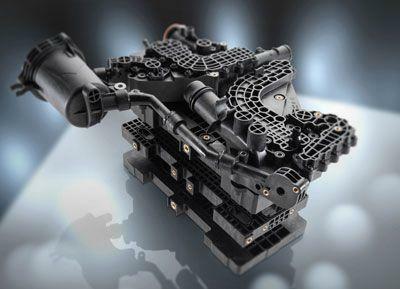 In close cooperation with Joma-Polytec and the Daimler AG subsidiary Mercedes-Benz Fuel Cell, several components of the fuel cell system have been successfully developed Plastic "Ultramid" from BASF. It is used as standard in the new "Mercedes GLC F-Cell", which is equipped with a combination of fuel cell and rechargeable lithium-ion battery. The polyamide Ultramid in the Mercedes GLC F-Cell offers good thermal and chemical resistance, dynamic strength, toughness and good long-term use properties. Together with the Joma-Polytec and the Daimler AG subsidiary Mercedes-Benz Fuel Cell, a development project was launched to optimally meet the extensive requirements: temperature resistance, media resistance, longevity. Due to the unique material basis as well as intensive material analyzes with regard to the chemical and mechanical resistance, the participating companies selected the tailor-made Ultramid grades A3WG10 CR and A3EG7 EQ. After successful testing of all components, the two glass fiber reinforced ureas are now used as standard for the production of the anode and cathode end plates in the fuel cell. With Ultramid A3EG7 EQ, a material is available which is ideally suited for sensitive applications in the electrical industry due to special purity requirements. With the media distributor plate and the water separator unit, which are exposed to a wide variety of media with the cooling water, air and hydrogen channels, this Ultramid proves its very good resistance and at the same time fulfills all requirements for the purity of the material.